Note: This article was originally posted on January 28, 2014. As this week’s record-setting cold snap has affected many parts of the country, it is a harsh reminder that extremely cold temperatures can threaten safe shipment of cuttings and plugs to greenhouse growers. When temperatures at night drop well below zero and daytime highs only reach in the mid-teens, greenhouse growers who have started production are feeling frustrated. When opening bags, smell the cuttings; if they have a compost-like smell, they probably are starting to decay from the cold temperature damage. 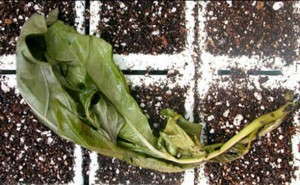 Michigan State University Extension recommends growers who receive cold-damaged plant material contact the vendor right away and make a damage claim. Sometimes you can immediately determine if the plant material is damaged; other times, you may want to leave the box inside over night at 55°F to 60°F and recheck the plants the next day and look for damage. If you decide to put them out on a bench to root, flag the group so if they do not grow as expected, you know it was because of the cold temperature damage during transit. Click here to read the full MSU article on chilling injury on cuttings, including moderately and very cold sensitive species and more photos of symptoms. This article was published by Michigan State University Extension. For more information, visit the Michigan State University Extension website. Thomas Dudek ([email protected]) is the district Extension horticulture and marketing educator for Michigan State University Extension. See all author stories here. I think everyone is an expert at detecting chill damage this year.